The chief histopathological variants of ameloblastoma are the follicular and plexiform types, followed by the acanthomatous and granular cell types. Uncommon variants include desmoplastic, basal cell, clear cell, keratoameloblastoma and papilliferous ameloblastoma. It seems of no significance to prognosis or clinical management whether a tumor is diagnozed as a follicular, plexiform or other variants of ameloblastoma, except for the clear cell variant. Some cases of benign and malignant lesions mimicking other periapical lesions radiographically, such as odontogenic cysts, lymphomas, periapical cemento-osseous dysplasias, central giant cell lesions and ameloblastomas, have been described in the literature. The aim of this report is to present a clinical case of a plexiform ameloblastoma in a rare location that was initially misdiagnozed as a periapical lesion, and was treated endodontically; however, failed to heal. Subsequently surgical enucleation was performed, and the diagnosis of plexiform ameloblastoma was confirmed histopathologically. An 18-year-old male patient reported from another private clinic to the Department of Oral Surgery in our hospital, complaining of pain in the mandibular anterior region since the past 6 months. Patient revealed past history of trauma in the same region 4 months back. The patient was asymptomatic 3 months following trauma; however, he noticed discharge from the lingual aspect of the permanent mandibular right canine since 15 days. The assessment of the previous medical history was non contributory. On extra oral examination, there was no observed swelling or lymphadenopathy. No expansions of the cortical bone or neurosensory defects were evident. Intraoral examination revealed pain on palpation in the mandibular anterior region. The overlying mucosa was intact with no signs of infection and sinus tract formation. The mandibular anterior teeth were intact and not mobile. An intraoral periapical radiograph revealed well demarcated unilocular radiolucency in the region of parasymphysis. 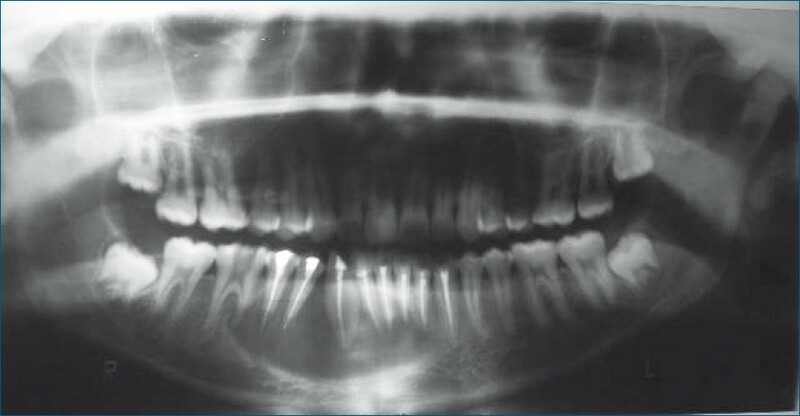 The panoramic radiograph showed radiolucency extending from tooth 33 to the mesial root of 46 [Figure 1]. There was no resorption of the roots of the teeth involved in the area of the lesion. Pulp vitality tests were performed with respect to tooth numbers 31, 32, 33, 41, 42, 43, 44, 45 and 46, and they were unresponsive to electrical and thermal stimuli. Based on the history, clinical and radiological features, a preliminary diagnosis of periapical cyst was established. Access opening was done and root canal treatment was performed for all the non-vital teeth involved in the area of the lesion. However, the patient reported again after a period of 2 months, with the complaint pain and swelling which had gradually increased. The swelling was 3 X 2 cm in size, with well defined borders and was hard on palpation. It extended antero-posteriorly from the tooth number 32 to 45, and superior-inferiorly involved the entire alveolus only sparing the inferior inferior border of the mandible, and caused expansion of the buccal cortical plates. Patient complained of pain on palpation in the area of the swelling. Fine needle aspiration biopsy revealed no significant pathology. As the lesion had not responded to endodontic therapy, the diagnosis of inflammatory periapical cyst was excluded. Other non inflammatory periapical lesions such as central giant cell granuloma, aneurysmal bone cyst, odontogenic keratocyst and ameloblastoma were considered in the differential diagnosis. The patient was referred to the department of oral and maxillofacial surgery and surgical enucleation of the lesion under local anesthesia with adrenaline was advised. A full thickness flap was raised, and an encapsulated lesion was located between the enlarged buccal plates. After enlarging the bony access, the entire cyst was enucleated by performing curettage of the lesion and protecting the mental nerve. The excised specimen was then submitted for histopathological examination. The patient's post operative recovery was uneventful with no signs of recurrence within 1 year follow up examinations. Microscopic examination revealed a plexiform ameloblastoma predominantly composed of epithelium arranged in long anastomosing strands and cords [Figure 2]. Under higher magnification these epithelial cells were bounded by columnar ameloblast like cells and were surrounded by stellate reticulum like cells. The supporting stroma was loosely arranged and vascular in nature [Figure 2]a, b. Thus, based on these findings, a final diagnosis of plexiform ameloblastoma was made. Ameloblastoma is a benign epithelial odontogenic tumor; however, can often be aggressive and destructive in nature, with the capacity to attain great size, erode bone and invade adjacent structures. Although it represents only about 1% of all the tumors and cysts of the jaws, it is the most common tumor of odontogenic origin. It is believed to arise from the remnants of the dental lamina cells of the dental organ, or can sometimes arise as a result of neoplastic changes in the lining or the wall of a non neoplastic odontogenic cyst, most commonly the dentigerous cysts and odontogenic keratocysts. Ameloblastoma can appear in the wide age range of 4 - 92 years, and does not show any predilection towards any gender. The most favored site is the ascending ramus (70%) followed by the premolar region (20%), anterior region (10%) and 10-15% are associated with a non-erupted tooth. In the present case, the patient was a teenager and the lesion was located in the mandibular anterior periradicular region, which is a rare site and also rare as per the age of the patient involved. Further, the lesion was not associated with any unerupted tooth. Clinically, it usually manifests as a painless swelling, and can be accompanied by facial deformity, malocclusion, ulceration, periodontal disease and paresthesia of the affected area. In the present case, history of trauma, negative pulp vitality tests, intact mucosa, absence of paresthesia and periapical radiolucency led to the diagnosis of inflammatory periapical pathology. The occurrence of non inflammatory pathosis in the periradicular area was not considered initially in the present case. Most studies on periradicular lesions focus on radicular cysts and granulomas, as these lesions are highly prevalent and associated with pulpal necrosis and infection. However, the occurrence of noninflammatory pathosis such as developmental odontogenic cysts, lymphomas, periapical cemento-osseous dysplasias, central giant cell lesions and ameloblastomas has also been described. ,,, Such well-defined periapical radiolucent lesions can present the clinician with difficulties in the differential diagnosis and in determining the treatment strategies. Correct clinical examination, non surgical approach and periodic follow up forms the recommended route for periradicular lesions. When endodontic therapy is ineffective in alleviating the symptoms, and clinical and radiographic appearance is not reliable for the diagnosis, the tissue specimens recovered in surgery should be submitted for a histopathological analysis to ensure a correct definitive diagnosis. 1. Becelli R, Carboni A, Cerulli G, Perugini M, Iannetti G. Mandibular ameloblastoma: Analysis of surgical treatment carried out in 60 patients between 1977 and 1998. J Craniofac Surg 2002;13:395-400. 2. Nakamura N, Mitsuyasu T, Higuchi Y, Sandra F, Ohishi M. Growth characteristics of ameloblastoma involving the inferior alveolar nerve: A clinical and histopathologic study. Oral Surg Oral Med Oral Pathol Oral Radiol Endod 2001;91:557-62. 3. Reichart PA, Philipsen HP. Odontogenic tumors and allied lesions. Chapter 5. United Kingdom: Quintessence Publishing Co Ltd.; 2005. p. 43-57. 4. García CC, Sempere FV, Diago MP, Bowen EM. The post-endodontic periapical lesion:.Histologic and etiopathogenic aspects. Med Oral Pathol Oral Cir Bucal 2007;12:585-90. 5. Iordanidis S, Makos C, Dimitrakopoulos J, Kariki H. Ameloblastoma of the maxilla. Case report. Aust Dent J 1999;44:51-5. 6. Dahlkemper P, Wolcott JF, Pringle GA, Lamar Hicks M. Periapical central giant cell granuloma: A potential endodontic misdiagnosis. Oral Surg Oral Med Oral Pathol Oral Radiol Endod 2000;90:739-45. 7. Nair PN. Apical periodontitis: A dynamic encounter between root canal infection and host response. Periodontology 2000;13:121-48. 8. Nary Filho H, Matsumoto MA, Fraga SC, Gonçalves ES, Sérvulo F. Periapical radiolucency mimicking an odontogenic cyst. Int Endod J 2004;37:337-44. 9. Wood NK, Goaz PW. Differential Diagnosis of Oral and Maxillofacial Lesions. Chapter 15, 3 rd ed. St Louis, MO, USA: Mosby; 1985. p. 320-56. 10. Cunha EM, Fernandes AV, Versiani MA, Loyola AM. Unicystic ameloblastoma: A possible pitfall in periapical diagnosis. Int Endod J 2005;38:334.
chava, v. and shankar, a. and vemanna, n. and cholleti, s.
kumar, v. and prathi, v. and manne, r. and beeraka, s. and natarajan, k.
misra, s. and lenka, s. and sahoo, s. and mishra, s.
devathambi, j. and aswath, n.